Our learners are preparing for a career in a field central to progress in nearly all aspects of life in the 21st century. From sports to medicine, battling climate change to building bridges, from wireless communication to analysing DNA, computer science and software engineering are providing the platforms for new discoveries and refined processes across all walks of life. Over fifty years, the school has built a strong research ethos and is now internationally prominent in the areas of computer vision, distributed and high performance computing, evolutionary systems, formal methods, and software architectures. We enjoy strong links with industry and have also attracted considerable competitive research funding from the Australian Research Council. We offer degrees in Computer Science and Software Engineering, while contributing to other degree programs in mathematics and engineering. 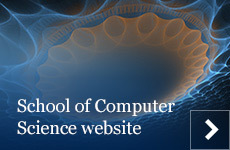 For information about the School of Computer Sciences, please visit our website.